MKC-704KHD is a medical grade high sensitivity (2,000lx/F17: Line Mix On) model Full HD camera. MKC-704KHD employs 3CMOS sensors for providing both of full HD (1920 x1080) and 4K (3840 x 2160) resolution image with the high sensitivity. 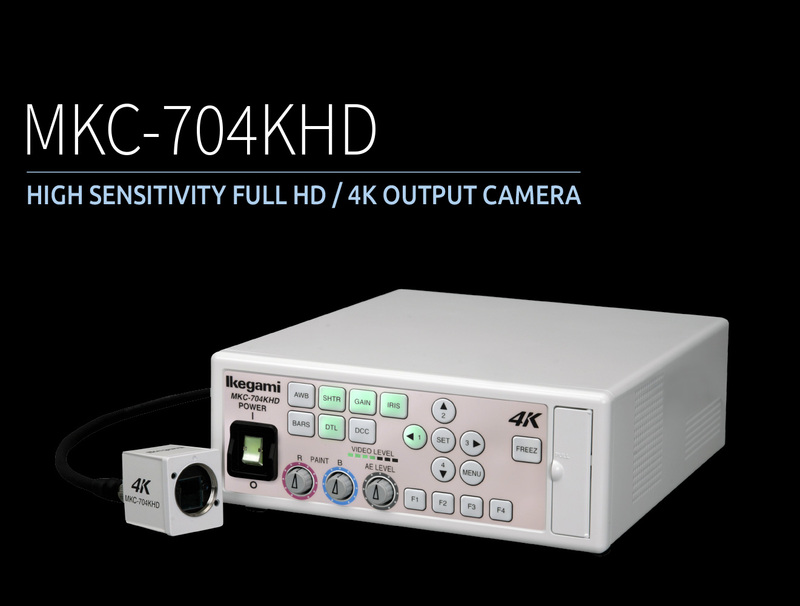 When providing full HD (1920 x 1080) & 4K (3840 x 2160) signal output, the MKC-704KHD has a sensitivity of F17 at 2000 lx (LINE MIX On). *Note: The trade off is some loss in resolution when using line mix. The compact and lightweight camera head is ideal for use in applications with limited space such as on a surgical microscope. The camera head and CCU (camera control unit) are coated to improve infection control. Image detail, resolution and modulation depth are significantly improved by special image-correction. Four switches are available on the CCU to custom assign to control functions important to the user. 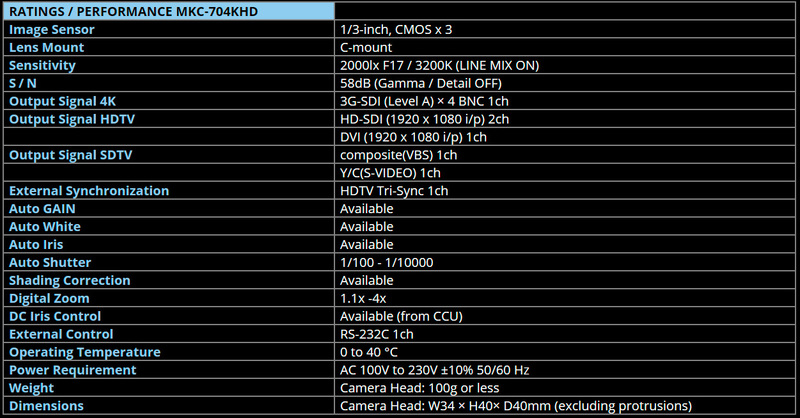 The CCU (camera control unit) outputs digital HD signals (HD-SDI and DVI), as well as, a 4K signal. By the internal down converter, composite signals (VBS, Y/C(S-VIDEO)) can be also output. By connecting an optional foot switch to the remote control terminal, external control is available for various functions including flip and turn function and scene file function. The captured images can be flipped horizontally and vertically by the digital processing to correct TV images against the optical inversion caused by optical instruments. Remote control is available via an external optional unit such as a foot switch. The gradation-corrector achieves a higher contrast image without halation or black defects. It also improves contrast in the detail area. 4 scene files are provided to keep pre-set memories of various control functions for convenient use. Scene file data can be saved into and loaded from a USB memory.